As we read, our minds can be activated in a variety of ways. Sometimes questions come up that might not be answered, a difference of opinion arises that isn’t cleared up or we want to say something. Our minds often linger on those questions, opinions, or ideas long after we have closed the book. Whether your students keep a Reader’s Notebook or you are looking for strategies that promote written conversations among students about books, here are some strategies for responding to text independently and with friends. Focused Freewrite or Quickwriting – The idea is to simply write for 15 to 20 minutes. Don’t stop for anything. Go quickly without rushing. Never stop to look back, to cross something out, to wonder how to spell something, to wonder what word to use, or to think about what you are doing. Freewriting is an exercise in bringing together the process of producing words and putting them down on a page about a specific topic or subject. You can write about a particular character in the text or a specific chapter or conflict. You can respond to what surprises you, what intrigues or disturbs you in the text. Metacognition Reflection – This response involves taking stock of where you are now, where you’ve come from, and analyzing what has happened to produce the discovered growth or change in yourself. In this response you are more self aware about yourself as a reader. Some guiding questions: What did you learn from what you read today and how did you feel about it? What is important to you about the book and what would you like to say about it? What connections did you make between your own life and experiences and what you read about today? Literature Letters – This response is a way for you to have a conversation with your teacher or another student about what you are reading. You will write a letter and will receive a letter back. All of the letters will record your thinking, learning, and reading. In your letters, talk about what you’ve read. Tell what you thought and felt and why. Tell what you liked and didn’t like and why. Tell what these books said to you and meant to you Ask questions or for help, and write back with your reactions, ideas, feelings, and questions. Dialogue Journals – Or written conversations are logs of reflections, reactions, and responses kept by a student and regularly exchanged with student partners in the class (Atwell, 1998). As you read the text, try to make connections between what you’ve read and what you already know. When you prepare to write a dialogue journal entry, think about how different parts of the text relate to your personal experiences, to things going on in the world, or to other parts of the book. For this entry you might pull out telling quotes from the text and respond to the quotes in your own words. Write Around (Daniels, 2007) – Form a group of four. Each person gets a large blank piece of paper and puts their initials in the upper left hand margin. As students work, request they follow the following: Use all the time for writing and don’t talk when passing papers. 1. Students write for one minute. Write your thoughts, reactions, questions or feelings about the topic. 2. Pass your papers clockwise. Students read through the entry on the page, and just beneath it, write for a minute. Write responses, reactions, or make a comment or ask a question. 3. Pass the papers again – repeat and continue four times total. You need to allow a little more time with each entry because students will have more to read with each successive exchange. 4. Now pass one last time and you should get back the paper that you began with. Now read the whole thing over and see the conversation you started. You won’t write the answer this time, feel free to continue the conversation out loud for a few minutes. All these strategies are Writing to Learn activities which means students are utilizing writing as a tool to promote learning. Writing to learn allows students to think on paper and helps students clarify and organize their thoughts and improve their retention of content. Collaboration plays a key role in elevating reading comprehension. Conversing with others helps readers to establish a connections and enables readers to generate new insight in their reading. My English classroom is all about group work. I am not a lecturer. My students work collaboratively daily. I believe that we learn from others and effective collaboration is talked about, practiced, and highlighted in my classroom through a variety of small group activities. Stephanie Harvey and Harvey Daniels’s book Comprehension and Collaboration (2009) offer six ingredients to group development: (1) Articulate Expectations; (2) Discuss and Decide Norms or Written and Unwritten Rules of the small group; (3) Friendship; (4) Leadership — the most effective groups are leaderless; (5) Open Communication; and (6) Address Conflict and Disagree Agreeably. Throughout the school year students are practicing and developing ways to work and communicate with others. 1. THINK DOTS or ROLL THE DICE– The teacher creates a numbered list of questions or tasks (6 for 1 die and 12 for 2 dice). In small groups, students take turns rolling the dice and complete the task. 2. JIGSAW – Just as in a jigsaw puzzle, each piece–each student’s part–is essential for the completion and full understanding of the final product. If each student’s part is essential, then each student is essential. The teacher breaks students up into a group and each student in the group has a specific reading or task which they are responsible for reporting back to their group members. 3. WRITE AROUND – A trustworthy Harvey Daniels activity that allows students to collaborate on paper and in conversation about a specific topic or subject. Here are clear directions for the write around. 4. LEARNING STATIONS – Also called “Learning Centers,” are situations around the classroom that a teacher sets up for students to work in small groups. Each of these centers has supplies and materials that work well together and give students the tools to complete activities and mini-projects. Teachers can tap into the multiple intelligences to create the center or tasks. 5. NUMBERED HEADS – Students are placed in groups and each person is given a number (from one to the maximum number in each group). The teacher poses a question and students “put their heads together” to figure out the answer. The teacher calls a specific number to respond as spokesperson for the group. By having students work together in a group, this strategy ensures that each member knows the answer to problems or questions asked by the teacher. Because no one knows which number will be called, all team members must be prepared. 6. MYSTERY ENVELOPES – A mysterious envelope is delivered to the classroom at the start of class and handed to specific students. Students open the envelope and must complete the tasks collaboratively to solve a mystery or answer questions. 7. GROUP TESTS – These are not really tests but I allow students to collaborate on quiz or test like questions. I offer two rounds: the QUICK FIRE round is a challenging task that students have 5 minutes to complete of one complex question and the first students to answer these right I might give them “Smarties” (the candy) or give them a pass on a certain amount of questions on the group test in the second round, the CHALLENGE. Students work collaboratively to complete a 50 or more questions. These can be multiple choice questions or basic comprehension questions. I have also put all the questions on a bingo board and required students to complete the entire bingo board. 8. AMAZING RACE – I did this in my To Kill a Mockingbird Unit, students were organized in teams and had to complete six different tasks I scattered around the school. Students were given clues to lead them to the different tasks. Students worked together to solve the clues and complete the different tasks. I describe the activity more in depth in another blog post that you can link to here. 9. THE FISH BOWL – I do fishbowls often, but I found these clear and simple directions from the blog Got To Teach. Divide the class in half. One half will form the center circle, facing inward. The other half of the class will form the outer circle, facing inward as well. The students in the inner circle will discuss a predetermined topic.The outside circle will be listening to the discussion, making note of interesting, new, or contradictory information. They are not allowed to say a word at this point. The inner and outer circles can then switch positions and repeat the steps above. 10. FOUR CORNERS – Again, another great collaborative activity from the blog Got To Teach. (I will be using Monday with my students to discuss the central idea of a text.) Choose four aspects of a topic that your class is currently focusing on. Assign each of these aspects to a corner (or an area) of your room. Present the topic and the four related aspects to the whole group and give the students some “think time.” Students can then choose a corner to discuss the topic. Have specific guiding questions available in the specific areas to help support and guide student discussions. Representatives from each corner can share what their respective groups discussed. Teaching digital citizenship is not easy. Although our students use social media daily, how are they using social media and is it in a way that is respectful to others. I say this because as my students engage in a global collaborative project about digital citizenship, I am learning that young people need many, many models of what responsible and respectful digital citizenship looks like. For our global collaborative project, students are using Edmodo to introduce themselves to one another and share research and ideas before working together in small groups to write a research report on a Wiki. For the first assignment students were to create a video, blog post, or Voki to introduce themselves to the group. After students uploaded their handshake assignment onto Edmodo, students could view each other’s posts and leave comments. 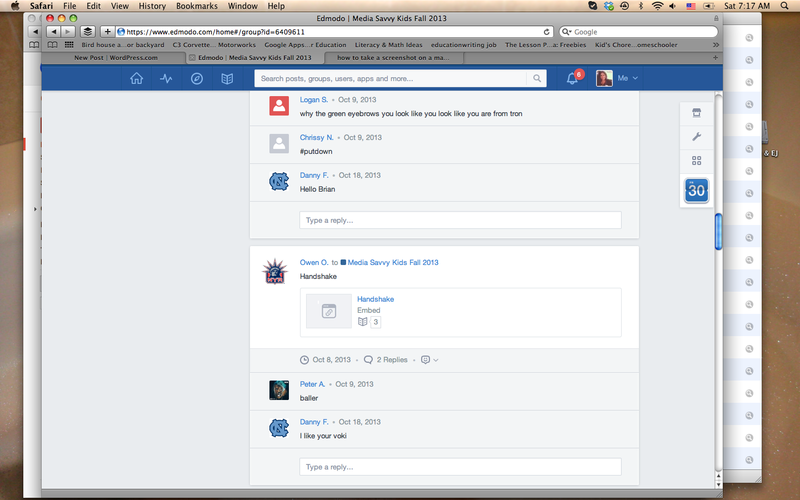 Here is a screenshot of many of the types of comments that I saw from students. This then led to a lesson on how to comment on each other’s blogs and posts. I asked that student comments need to fulfill the following criteria: (1) Be positive and no put downs, (2) Be specific, (3) Find something to connect to, (4) Ask a question, (5) No chat or text lingo. I realized that students do not really know how to sincerely complement each other. When I would see or hear students complimenting each other it seemed superficial and on a surface level, “I like your sweater” or “Those are cool kicks.” I was inspired by the video below and spent this week teaching and talking about sincere compliments to help building community and comradery in my classroom. Schools spend lots of money on anti-bullying curriculum and assemblies and students are tired of hearing the anti-bullying messages. Yet, bullying is still going on in and outside of school. We see it in the media and in popular movies. The question is what is going to work to help make our culture more understanding and sensitive to people’s differences. This is a challenge I face everyday. If you have any ideas or if you are doing is working please share your ideas. This fall my students are participating in the Flat Classroom Digitween Project, one of many global collaborative project founded by Julie Lindsay and Vickie Davis. Students around the world participating in the project study and explore digital citizenship and how to be responsible and reliable online learners. The purpose of the project is to educate and promote responsible online choices as well as immersing students in an online educational community for learning and collaboration. Students collaborate researching and writing a report using a wiki and create a school-based action project that is documented on the wiki. In our technologically advanced world today, digital citizenship can mean a lot of things. The project is organized according to the five areas of awareness that relate to being a digital citizen: technology, individual, social, cultural, and global. To help introduce the five areas of awareness to my students I showed my students the two videos “I Forgot My Phone” and “Emma, Le Trefle.” Both videos are funny that make big statements. Many argue face-to-face society is being impacted negatively by technology causing inattentiveness of people to their own families and friends. Cell phones interrupt movies, celebrations, social events, and often become intrusive. This aspect of digital citizenship falls under Social Awareness. After viewing and discussing the two videos in class I asked my students to create a code of conduct for cell phone use in public places. This was not an easy task. Students debated whether talking on the phone and texting was appropriate at the dinner table and shared other stories about award experiences with cell phones. It was a lively discussion. Students need to engage in conversations like these so they can make good decisions as digital citizens when it comes to etiquette and respect, responsibility and safety. Global collaboration is an innovative teaching tool that helps prepare students to become active participants in our global community. Global collaborative projects tap into many of the existing and emerging skills and literacies required of teachers and students: listening, reading, writing, speaking, problem solving, creating, and using technology to practice digital citizenship (NETS). In fact, collaboration is included throughout the Common Core Learning Standards. It states in both the K-5 and 6-12 standards for speaking and listening, “Prepare for and participate effectively in a range of conversations and collaborations with diverse partners, building on others’ ideas and expressing their own clearly and persuasively.” (CCLS, 2010) Global collaborative projects help to meet these standards. Many global collaborative projects currently exist that teachers can apply and participate in such as Flat Classroom Project, iEarn, and Classroom2.0. Teachers can also create their own global collaboration projects. Global partnerships are about making connections with other teachers and schools to benefit all students’ learning. These partnerships can be made through Twitter, blogs, conferences, and or even with teachers around your school district. At this fall’s Edscape Conference (http://edscapeconference.com), I connected with the educational coordinator from the Japan Society in New York City to establish a partnership between students at a school in Japan and my middle school students in Rye, New York. The global collaborative project benefits my seventh and eighth grade media literacy elective. During the semester course, I use Disney animated films to teach critical theories of gender, race, class, and age. To broaden the unit, I add Japanese anime so students can understand how anime can be a window into other cultures around the world. Japanese anime becomes an exciting catalyst to spark conversation and global awareness among my students in New York and the students in Japan. The goal of this project is to expand my students’ world views of different cultures through media literacy and more specifically, anime. Communicating. Prior to participating in the global project with the students from Japan, I spend a week setting up the project with my students. I teach netiquette and responsible digital citizenship. Teachers cannot assume that students know how to work together collaboratively in the classroom, let alone online. When working with students around the world, one must take into consideration language barriers and cultural differences as well. Teachers need to support students throughout a global project to help to facilitate successful collaboration and communication. To help initiate a discussion about working with others, I give my students different scenarios with “sticky” small group situations, and I ask them to brainstorm positive responses. For example, one scenario includes a small group with one student who acts as a dictator and completes all the work while other group members take a backseat to the project. Another scenario is about miscommunication among group members. In the third scenario one group member’s contributions are inaccurate, but the other group members do not want to hurt the student’s feelings and the work is wrong. My own students resolve these small group situations and create positive alternatives. Collaborating. There are three elements to the media literacy global collaborative project. First, students participate in an introductory assignment where, individually or with a partner, they create a written blog post or digital video about themselves and the community where they live. Students share these videos and blog posts online using the Japan Society’s secure social networking site, “Going Global.” This introductory “handshake” allows students to introduce themselves to the global participants and share information about their own cultural interests. Students have the option of taking pictures of their community to include in their post to provide a visual perspective on the community where they live. This assignment not only helps students to see the commonalities and differences among all the participants, but it also initiates inquiry and interest among students. After the initial handshake, students view two Disney animated films and two Japanese animes. This year students view the recent Disney princess film; Tangled (2010) and Brave (2012). Then students view My Neighbor Totoro (1988) and Spirited Away (2001), both by Hayao Miyazaki, who has been called the Walt Disney of Japanese anime. Each student is assigned a critical theory to research and write a collaborative report on a Wiki. Students then apply the critical theory to the films and include the analysis on the Wiki page. As an example, students collaboratively critique how gender is represented in both the Disney films and Japanese anime. In addition to the collaborative piece with the students in Japan, I have my students collaborate with another member of our class and create a video segment discussing their critical theory applied to the Disney princess films. We link all the videos together to create a “Choose Your Own Adventure” video montage on YouTube. YouTube has an feature that allows teachers to insert a hyperlink into the video uploaded using the spotlight annotation tool. Students write their own scripts based on their research and analysis, and then we spend four class periods recording the videos. As a final step, I upload the videos to YouTube and link the videos together. The project has multiple layers. Each component of the project is scaffolded for the diverse range of student abilities. With each element of the project, I present my students with models, checklists, and assessment rubrics so they know the project’s expectations. Culminating. Creating a successful global collaborative project requires much planning. Clear goals and outcomes with all participants must be communicated. A successful project is interactive, engaging, and revolves around real questions and problems. Whether participating in an already existing global project or creating your own, global projects allow students to utilize multiple skills relevant to succeeding inside and outside of the classroom. This article was written for and appeared first in the inaugural Literacy Special Interest Journal for ISTE. Be sure to check out all of the intriguing literacy projects described in the journal’s first edition.